Beginning this month, I'll be engaging pop culture in a different way on the blog. These Roundups will no longer appear monthly, but instead three times a year near the end of each season: Winter/Spring, Summer, and Year-End. They will be a cumulative look at media enjoyed during each designated span of time. In the meantime, I hope to increase writing longer pieces about specific books, movies, shows, and albums and how they intersect with issues of faith and life. Today's Roundup is a beta test for what future installments will look like. The past few months I've become interested in the Enneagram, a personality test that boasts of its scientific roots and accuracy. Through a series of questions, this test determines which of nine basic types you are, each identified by a number. Many resources not only provide a test to determine your type, but tips and analysis regarding what it means and how you can live into the best of who you are; even transcending your tendencies. I eventually discovered that I'm a 6, but leading up to that I had to read as much about it as I could to make sure, which is what 6s apparently do. 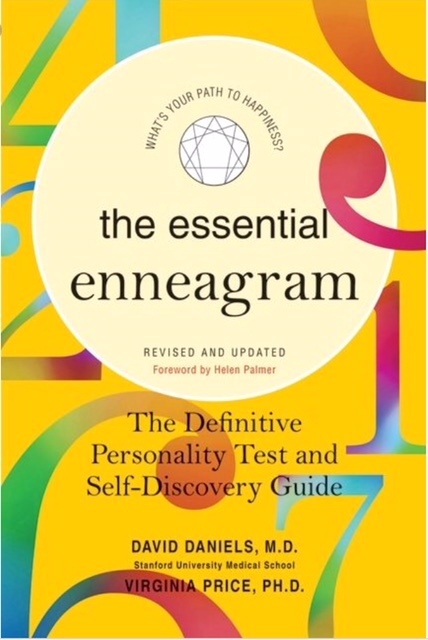 The Essential Enneagram by David Daniels and Virginia Price - This provides a barebones introduction to each type, including a simple test at the beginning and a section on what each can do to address its growing edges. The Road Back to You by Ian Morgan Cron and Suzanne Stabile - A more in-depth look at each number than Daniels/Price, but no self-administered test and a little too hyperbolic in its type descriptions at times. The Sacred Enneagram by Christopher Heuertz - A look at the enneagram from a more spiritual perspective. Again, no test, but some thorough explanation that would help any reader identify their type. I recently read What I Am Living For, a new collection of essays inspired by the life and writing of Thomas Merton. Covering various aspects of Merton's favorite topics and most notable experiences, these essays explore a man who was both centered and flawed, devoted and conflicted. The contributors often cover similar topics, sometimes from different angles, which help reinforce what was most influential to Merton and what from his catalogue is most influential to others. It's fascinating to get a fresh glimpse into how Merton continues to be a force in modern contemplative spirituality. I also read Transforming: The Bible and the Lives of Transgender Christians by Austen Hartke. Hartke provides theological insight into an area of Christian faith that is still more on the fringes and misunderstood from what most might consider a "mainstream" perspective. The reader is given some much-needed depth of understanding into what being a part of church, reading the Bible, and serving in ministry are like for transgender Christians, who often have to deal with so much stigma, stereotyping, and ignorance. I certainly needed a resource like this, and would recommend it far and wide to anyone needing to understand this often-overlooked demographic. This month I read and reviewed Inspired: Slaying Giants, Walking on Water, and Loving the Bible Again by Rachel Held Evans. You can find my review here. I also read and reviewed God, Improv, and the Art of Living by MaryAnn McKibben Dana for The Englewood Review of Books Easter 2018 issue. Subscribe to get your copy here. I watched Battle of the Sexes, which recounts the famous tennis match between Billie Jean King (Emma Stone) and Bobby Riggs (Steve Carrell). The film tries to give equal time to both sides, including fleshing out their lives and what they're going through leading up to the match, but King definitely gets a more well-rounded treatment. It portrays King's relationship changes, self-discovery, and struggle to get equal pay for women in her sport, while for Riggs we mostly see his problems with gambling and some brief snippets of his personal life with minimal sympathy. I liked it but it had an uneven quality. 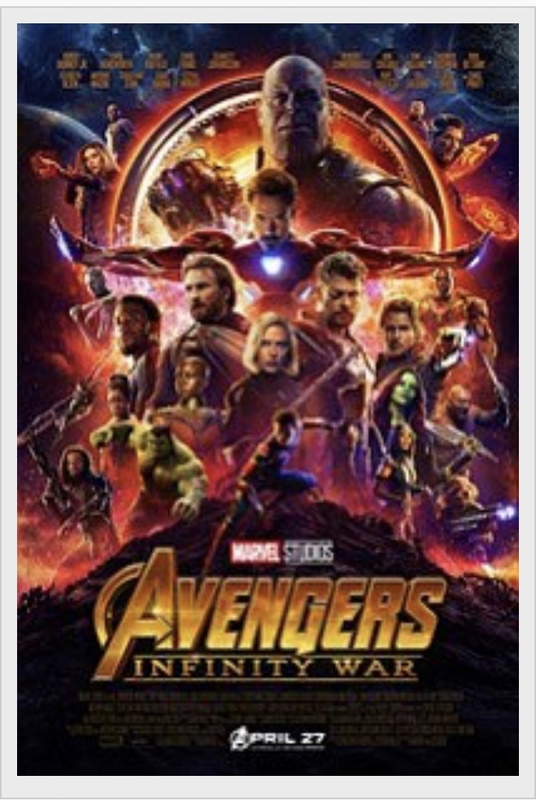 We saw Avengers: Infinity War on opening weekend, which brings together almost every notable character from ten years' worth of Marvel Cinematic Universe movies to battle Thanos, the most formidable villain introduced in that span. Thanos' big goal is to collect the six Infinity Stones and wipe out half of all life in the belief that those who remain will enjoy greater prosperity and resources. Our heroes team up in various configurations that bring some fun interactions, but the movie always leaves hope just beyond the viewer's reach, with a cliffhanger both surprising and gutwrenching. Thanos is one of the most well-developed villains the MCU has had, and I can't wait until next May to see this story's resolution. I watched Please Stand By, starring Dakota Fanning as Wendy, a young woman with autism who lives in a group home. The person who runs the home has her on a schedule, she keeps a job at Cinnabon, her sister regularly checks in on her, and she loves Star Trek. When she realizes that the only way she can enter an original script in a Star Trek fan contest is by traveling to Los Angeles by herself, she sets off on a road trip that takes many twists and turns. Fanning is such a versatile and talented actress, and she balances the tension, resolve, and innocence of her character very well. I also watched Come Sunday, a Netflix original movie starring Chiwetel Ejiofor as Bishop Carleton Pearson, a pastor of a prominent megachurch who comes to a realization that he no longer believes in hell. When he starts exploring this newfound belief in his preaching, his church and ministry begins to unravel. There's a lot to unpack in this movie, from theological issues to denominational politics to some racial undertones. Ejiofor is amazing in everything he does, and this is a well-told story of how quickly people can turn on you when you explore new ideas that make them uncomfortable. We went to see Deadpool 2 on opening weekend, where Ryan Reynolds' title character has settled into a life of living with his longtime girlfriend while working as an international-level assassin. But after things take a tragic turn, he finds himself without direction or purpose until a teenage mutant boy needs his help, and he faces a new threat in the form of time-traveling half-cyborg supersoldier Cable. While the movie has a lot of the same irreverent humor and fourth wall-breaking as the first, there's a certain weight and heart to this movie that the first one didn't have. 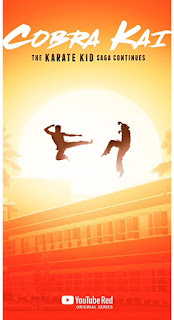 Earlier this month I binged through the new Youtube Red series Cobra Kai, which revisits the lives of Daniel and Johnny from the Karate Kid movies. Each has traveled a very different path, with Daniel becoming a very successful car dealer while Johnny is trying to live day to day in between beers. 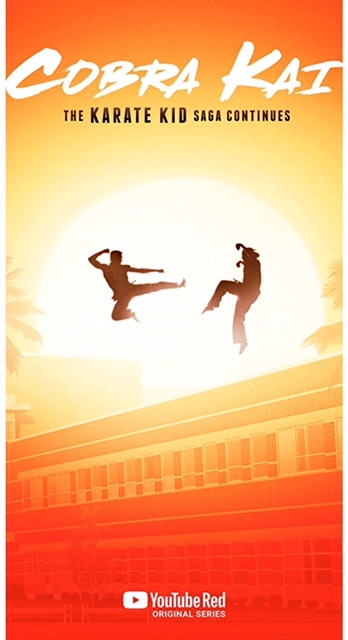 Johnny stumbles upon a teen in need of guidance and confidence, he decides to open a new dojo under the same name and philosophy, which in turn reignites his old rivalry with Daniel. The series is able to hold in tension each side's motivations such that there is no clear good guy or bad guy, with many of the characters going through times of seeking clarity and direction, going through misunderstanding and growth. It also recalls a lot from the movies without dwelling on them or degenerating into a pure nostalgia trip. I've been making my way through all episodes of Black Mirror on Netflix. This show is an heir-apparent of The Twilight Zone, with every episode featuring situations for its characters that at least begin positively or strangely, but by the end have twisted into something dark or unexpected. The stories often center on some form of technology that has somehow dictated how the characters live but present or lead to damaging consequences either personally or relationally. With very few exceptions, I've enjoyed what is a well-written, thought-provoking series, and I'm often left pondering each episode for days afterward. In recent years, Marian Hill has become one of my favorite bands. They have a sound that is slinky and smooth, and their newest, Unusual, is no different. Here's their first single, "Differently:"
I've also been enjoying the new album from Courtney Barnett, Tell Me How You Really Feel. There's an earthy, grungy feel to Barnett's music as she sings about love, loss, striking out on her own, and resigning herself to what she can do in the face of imperfect circumstances. Here's her song, "Nameless, Faceless:"